Zhang Ruimin, Chairman and CEO of Haier Group, was recently invited to attend the 7th International Business School Shanghai Conference with the theme of “Impact and Change”, and gave a speech at the plenary session. As the only entrepreneur speaker at the conference, CEO Zhang’s speech was warmly received by the participants. Professor Chen Fangruo, dean of the Antai College of Economics and Management of Shanghai Jiao Tong University, said that many of the ideas expressed in CEO Zhang’s speech are worthy of deep consideration and study by business schools. 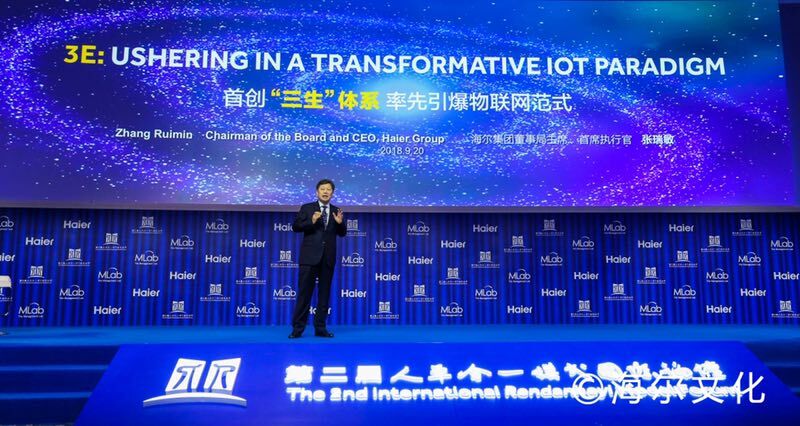 During all its history, Haier has shown a great competence in the business innovation and transformation, especially in the IoT area. Haier Group was approved to lead the establishment of international standards for mass customization models and industrial Internet platforms by three international standards organizations including the Institute of Electrical and Electronics Engineers (IEEE), the International Organization for Standardization (ISO), and the International Electro Technical Commission in December 2017, May 2018, and July 2018 respectively.